The need for effective visual communication in architecture is deeply rooted and ever-more relevant, with the adoption of new technologies becoming imperative over the next few years. 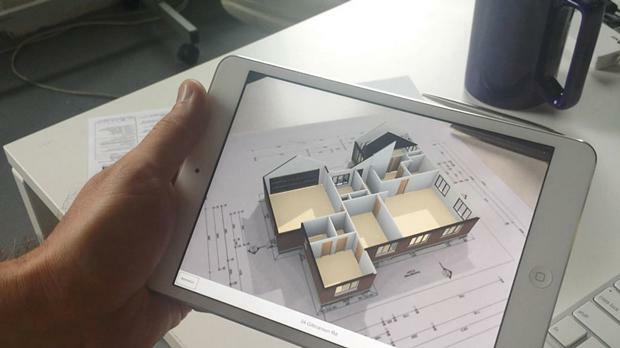 Augmented and Virtual Reality (AR and VR) are offering new ways to interact with projects and clients, changing the marketability of architects and the way they design. Sydney-based AR company, Auggd, aims to be at the forefront of delivering solutions and strategy to architects and designers. Auggd CEO Jodi Watson says incorporating these technologies will be vital to the future success and competitiveness of a practice. “It will be paramount in the next two to three years that architects embrace it,” Watson says. AR involves layering digital information over a site-specific interactive view, through an app or digital device, while VR is a fully-immersive and scaleable digital experience, often viewed through a headset. The Auggd team testing the VR technology[/caption]ThomsonAdsett Group Director of Design and Education & Communities, Graham Legerton, says the firm has been using AR for nearly two years. “It’s been very useful for us in pitching for projects, communicating schematic design concepts and the continuing evolution of a design in a virtual sense,” he says. The technology will continue to grow as an integral part of how architects design, bid and pitch, and Legerton says the heightened level of communication on offer is the real benefit. “I think a lot of clients, and teams even, struggle to read two-dimensional drawings, and providing the experience is the key differentiator,” Legerton explains. Wilson Architects Director John Thong, says the opportunities for AR and VR to change the way the people experience architecture depends on each user. “There are some thoughts that this technology will revolutionise the way people perceive space, whilst others may consider it just a further development of technology to assist the design of spaces,” Thong says. The nature of the technology allows multiple viewers of the augmented image, as well as the ability to link to a remote location, making it a useful day-to-day team experience as well as practical for formal presentations. Legerton says AR is only one of many communication devices used on a project but it has the ability to reduce risk and share process design with a client. “We’re in the business of generating experiences for people, so if we can communicate those spacial experiences and moments of buildings more clearly, then it’s definitely in our favour,” he says. Watson explains the technological advances in VR have the potential to alter the design process, by enabling architects and designers to see instantaneous changes in real time. “It will completely disrupt the design process, which will benefit architects, because they are able to have that additional level of experience as they’re designing,” she says. Legerton agrees AR and VR are best used in collaboration with other mediums, and says though recent graduates have technological skills in abundance, they still need to focus on having the ability to communicate, sketch and conceptualise. “It’s only one component, but it’s becoming an increasingly important one,” Legerton says of technological communication. In architecture, Thong says it’s particularly important to be aware of future technologies and of all possibilities while designing. “It moves at a rapid rate, so it’s important to keep abreast of new developments,” he says. Watson says the systems are an extremely powerful tool for those wanting to embrace the change, and will soon come to be a part of everyday architectural life. “It’s not a matter of whether they should adopt it – it will soon become a must,” she says.